Although ecosystems are the most living areas of cities, they remain hidden from view on city maps of the built landscape or paved roads that define the mobilty of “urban” life. 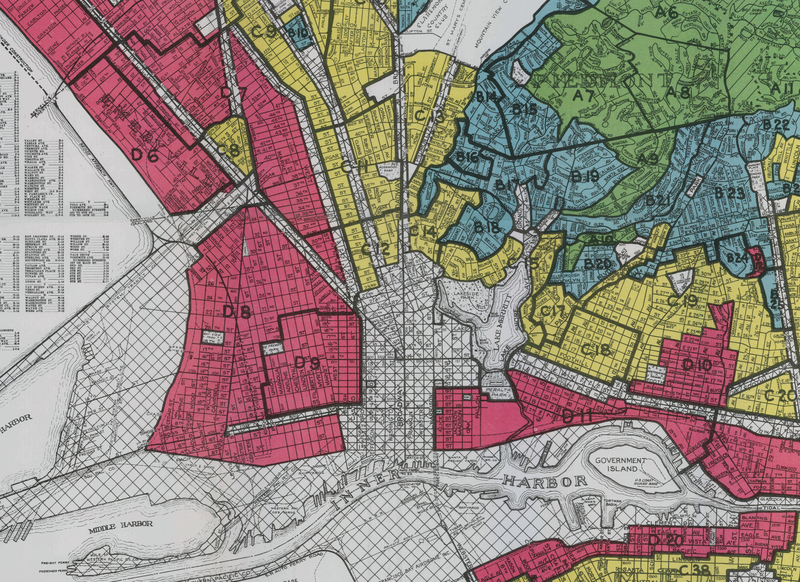 But we often fail to orient ourselves to the extent of urban environments in most maps. And the changing vulnerability of cites to climate change and extreme weather has directed increased attention to the vulnerability and instability of urban space, in ways we are still taking stock through maps, the question of what maps best orient us to the future of the city have provoked increased attention from maps of sea-level change, to maps of vulnerability to earthquakes and seismic risks. No city has been more subject to such demands for recalibrating its lived space, perhaps, than San Francisco, the city that is most conspicuously built on several fault lines–so much that the expansive recent downtown rebuilding is cast as a “seismic trap” or a disasters waiting to happen. 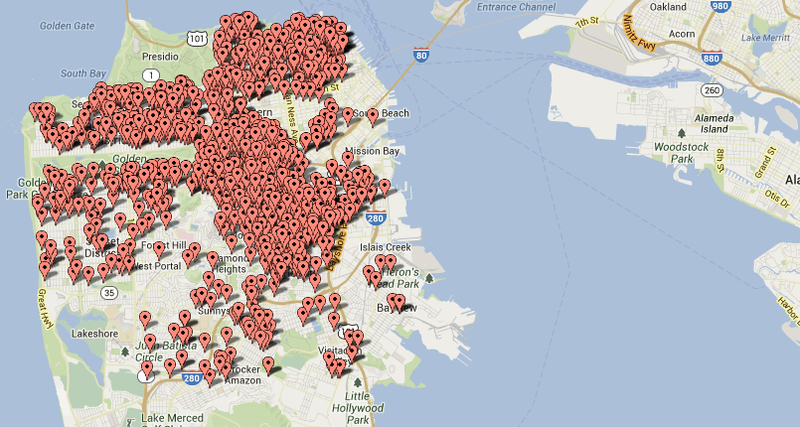 –and to take stock of the natures of San Francisco, and the benefits of different forms of mapping its urban environment in less melancholy ways, and indeed of the importance of taking new stock of a city’s remaining open space–or what that open space is, and how we might best interact with greenspace remaining in the city, and the importance of how we map the urban spaces we live. While San Francisco was long a center for nature preservation, and indeed the preservation of the country in the city, as the perceptive Bay Area geographer Richard Walker put it so eloquently, the organization of tools to uncover and preserve the current relation between ecological niches, natural environments and the built city becomes the project of the recent Nature in the City map, now in its third edition, offers the symbolic tools built on data to explore the urban environment–absent in most street maps or apps that we use to navigate the city, and to revalue the critical importance of native habitat in the open spaces existing within the city’s built environment, and offers an engaging and timely injunction to attend to and help cultivate it. 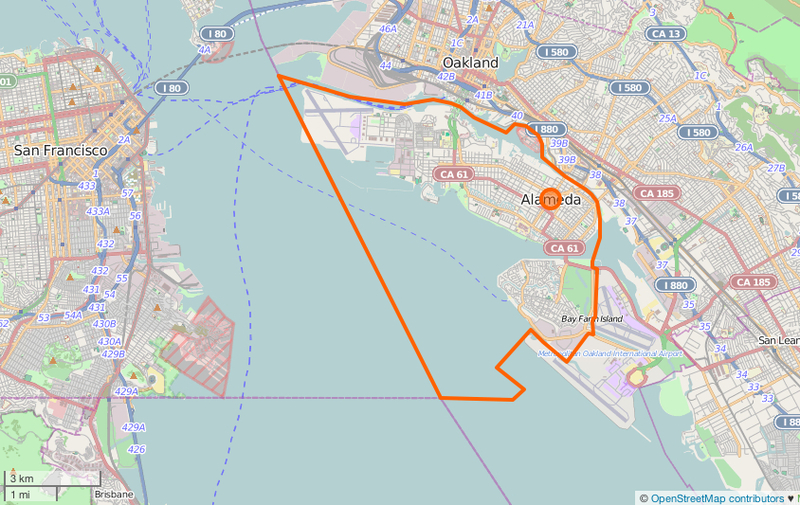 The suggestion of the city’s integration with not only its bay and shoreline, here shown as a thin strip of brown that borders on the Pacific, tied to historic estuaries, rivers, creeks, and current parks, presents an image of the city as an integrated whole, in which the blocks and streets foregrounded in GoogleMaps are far less prominent than the deeper continuities that create unique habitats, which are finally presented to the reader. We don’t see the Great Highway, for example, but the sand dollars and , and in Hunters Point find oysters and shorebirds–and in place of navigating a grid of grey, explore a region of butterflies, poppies, and jackrabbits, as well as a coyote, and even, out in the Pacific, the image–in the selection below just a glimpse–of a whale’s tail. The plentiful creatures within the vivid map, which breaks the barrier between cartography and art, reveals a far more engaging, and ethically challenging, question of what it is to map a city and to attend to the built space of a city as a place. 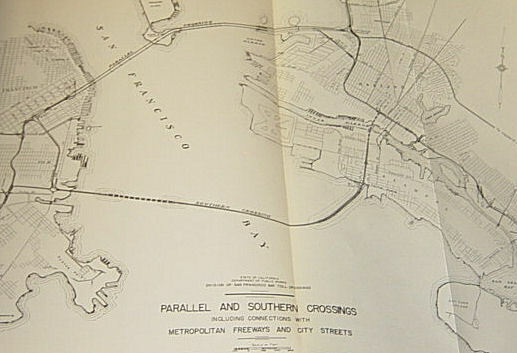 For rather than compile a survey of the built environment, and orient the river to streets, main highways and the neighborhoods we give to urban space, the static map offers an engaging relation to the habitability of a city so often bemoaned as increasingly unhabitable due to skyrocketing rents, gentrification, and evictions. The quite distinct base-map that folks at Nature in the City organization adopted to invite us to view San Francisco helps to shift that set of associations, and to open up hidden spaces within the city to viewers in ways they might never have had access, putting the place of San Francisco as a part of the thin line of green coast and as a potentially rich set of open spaces, habitat and green. –and effectively invite viewers to navigate, and explore, a city where rents have withdrawn most of our attentions from the lived environment. The base map rich with data sets of the multiple green spaces in the city, from parks to all street trees and gardens, as if they and the surrounding waters afforded a palette–which if pictorial in nature, offers a synthesis of public data on open space. 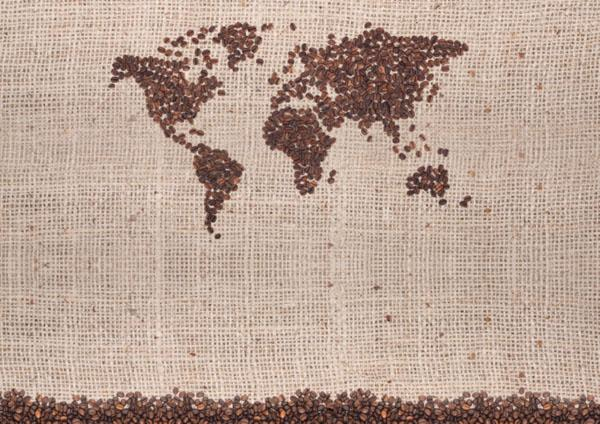 And the data helps to situate the existing habitat that the non-profit has dedicated its energies to encourage, inviting viewers–and residents–to shift their attention from the city streets and built spaces to the conscious cultivation of the wild. The result is to re-focus attention on the habitats of specific animals, birds, fish, and plants across its urban space, in a static map that is made for an audience familiar with interactive mapping forms, and the coding of a rich natural space, extending to imagining its lost estuaries, underground rivers and watersheds, and even the historical shorelines of San Francisco before the addition of landfill. 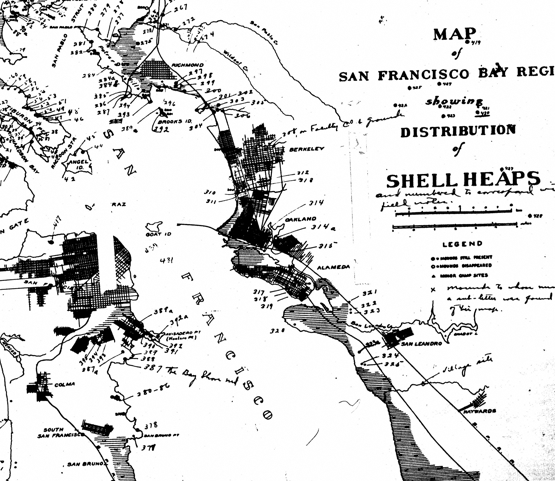 The relation between land, sea, and landfill long provided something of a dilemma of cartographical rendering in the Bay Area, mirroring the fluid relationship that has long existed between land and sea. 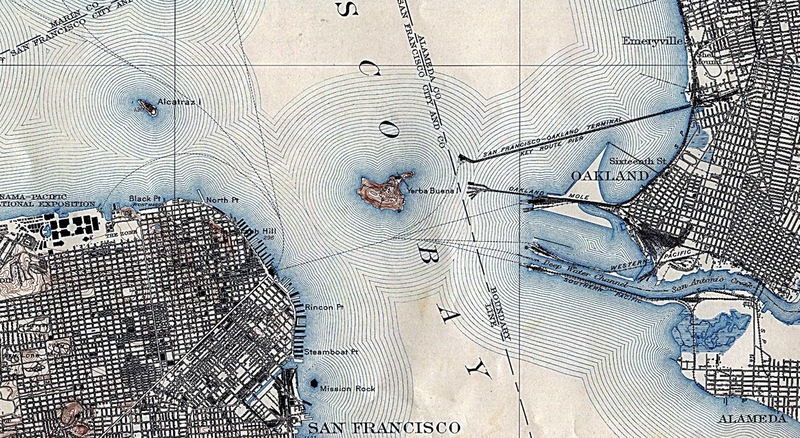 But if fluidity of the shore was less understood in terms of erosion, global warming, coastal flooding, and king tides, the human fiction–and graphical statement–of the map provided a supple too to engage with the question of the shifting contours of land and sea in the years after John Reber sought to expand the landfill of West Berkeley to extend into the San Francisco Bay, in a forgotten monument of post-war engineering that maps provided a compelling tool of collective action to forestall the restriction of the San Francisco Bay–and of its habitat–that might have been, by dramatically shrinking its size through a massive addition of bay fill that effectively re-engineered the bay into freshwater lakes transformed the harbor to housing tracts. 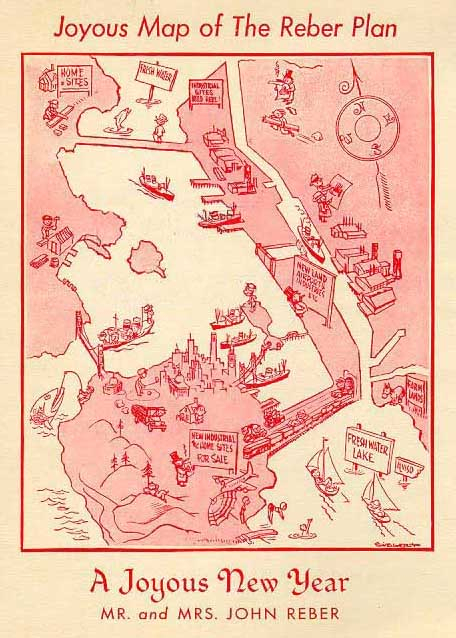 While the image of the proposed project for narrowing the San Francisco Bay with landfill has been long forgotten, it marked a striking rhetorical redeployment of an engineering plan to stir up public opposition to the narrowing of the harbor with bay fill that John Weber had enthusiastically advocated since the late 1950s into a movement protecting the open waters as a unique open environmental space. The transformation of a harbor that had been designed by the predominantly commercial mandates of a harbor was transformed into an ideal the aesthetic protection of open waters through the unexpected power of how the image of a lost landscape was evoked by the proposed augmentation of landfill additions that would allow the expansion of San Francisco and Berkeley as cities that could be traversed by cars; if Weber believed that the project he long championed would correct the “geographic mistake” by which the bay fragmented a master-plan for the region, seeking to shrink saltwater influx that had interrupted the expansion of a metropolis that would link Oakland and San Francisco. 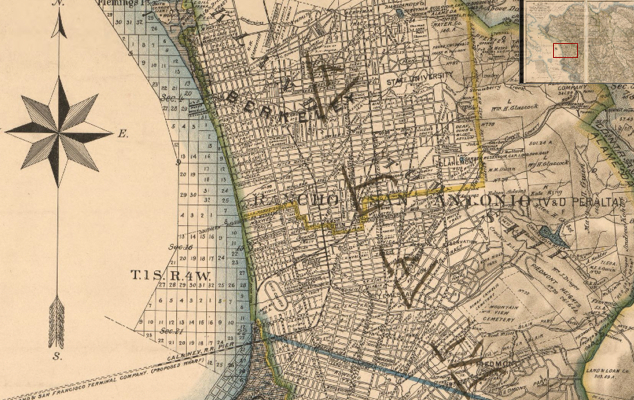 Reber may have compensated for his lack of formal education by his adherence to maps in his persistent promoting and continued evangelism of his vision of urban modernization of the Bay, relying on the plan as a theatrical device to accommodate the “geographic mistake” by the expansion of paved areas, locks, roads, and viaducts Robert Moses-style. But the ultimate rejection of his plan came as the very image that proposed the effects of bay fill-reduced open waters was re-presented to invite viewers to consider the definitively changed relation to place that such a massive public works construction would create. 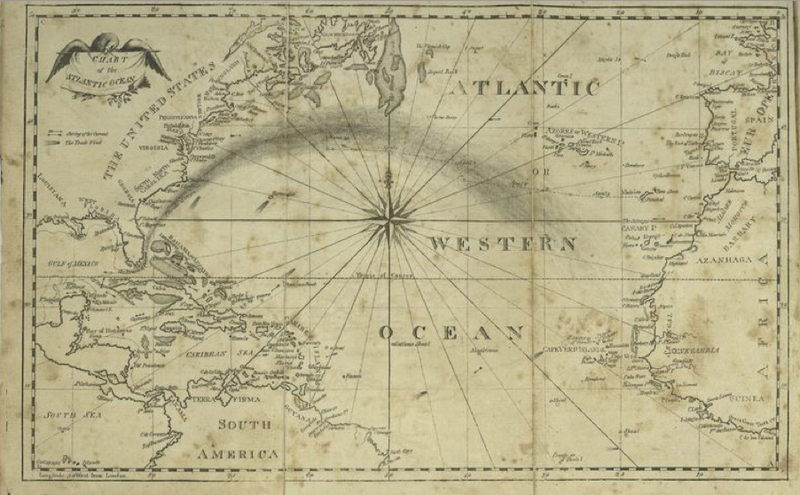 For the map, reprinted beneath the three words “Bay or River?,” linked text and image to trigger resistance to the new relation to space that the disappearance of the Bay’s open waters would have implied. 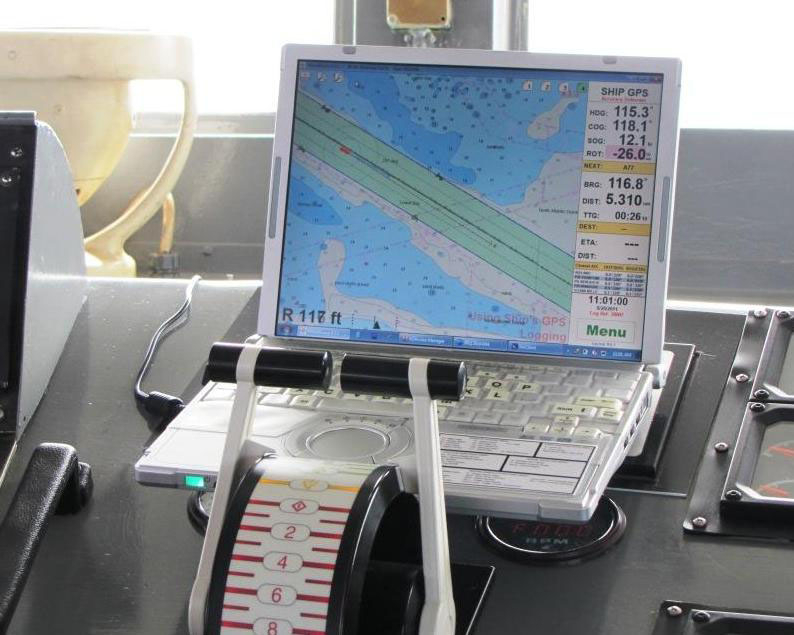 It prompted resistance to crystallize against the proposed public works projects to add bay fill to replace the saltwater active harbor with that would promote the expansion of urban spread and forever change the lived setting of the region. 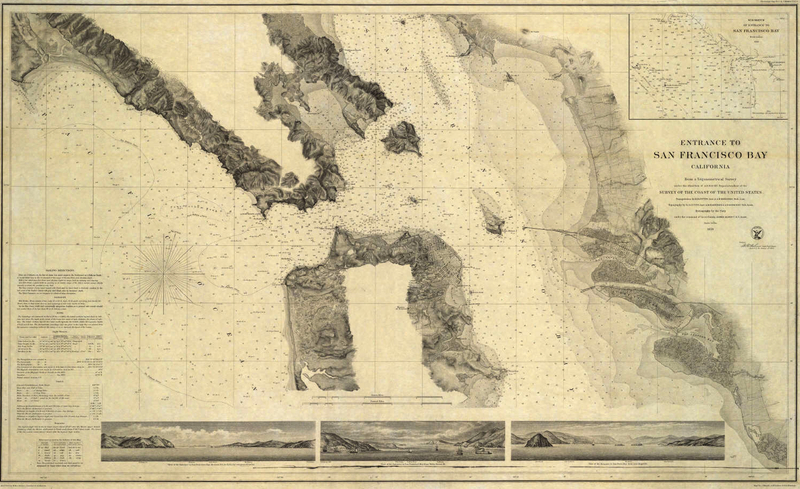 The addition of a simple interrogative invited viewers to imagine the landscape that they desired, “Bay or River?” not only attracted more immediate attention than any of REber’s maps but mobilized opposition to the effects of encroachment with the force of a public polemic of preserving an aesthetic–rather than only commercial–landscape. At the same time as growing public awareness was directed to the mitigation of water pollution as discharging raw sewage and pollution into harbors and rivers diminished as a common practice with passage of the first water quality laws that led to the 1960 Clean Water Act, and five years later created the Land and Water Conservation Fund for recreational spaces. But the resistance to Reber’s plans for the closing of the open waters of the Sacramento Delta led to a collective topophilic rendering to the preservation of wetlands and estuary that prevented the impending additional of landfill to contract the San Francisco Bay that would have erased the estuary and bay alike, so resonant to lead the Save the Bay grassroots citizens’ movement to preserve and protect its open waters against the constriction of the Delta and estuary, and erasure of open spaces of wetlands. 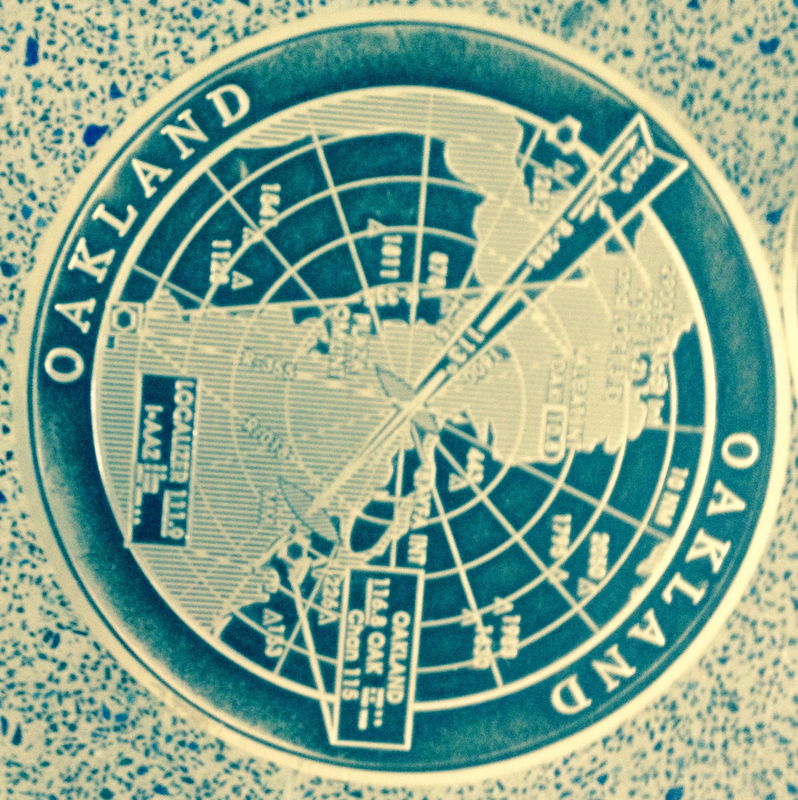 The legend transformed a plan into a map which intersected with readers’s mental geographies in particularly powerful ways; by inviting viewers to map which of two futures they wanted against their experience, the image became a lodestone for preserving the open space of the bay, as well as a powerful icon of regional topohilia and an emblem of resistance to the over-engineered landscape that we identify with the proposed shrinkage of the Bay to a canal whose space would have been dominated by barriers and ship locks. 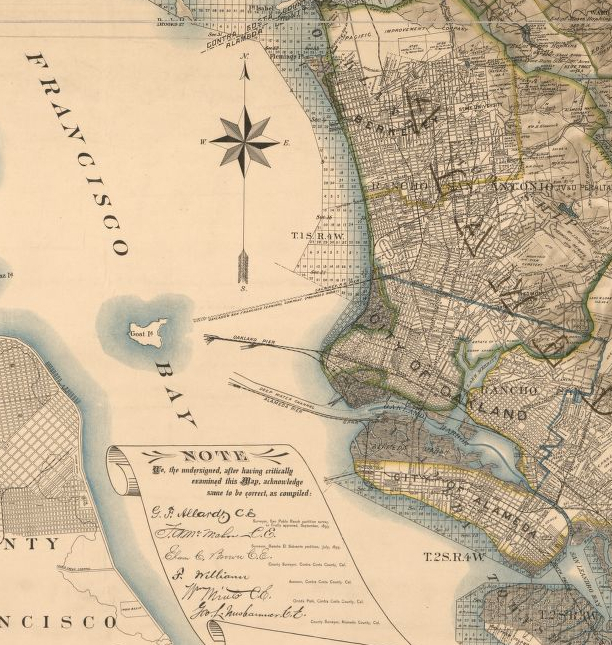 In the map that was made and distributed by the Save the Bay movement, it is striking that the land already built on in the Bay Area is rendered by a delicate stippling of the sort that once might have indicated marine expanse in many early modern engraved maps. 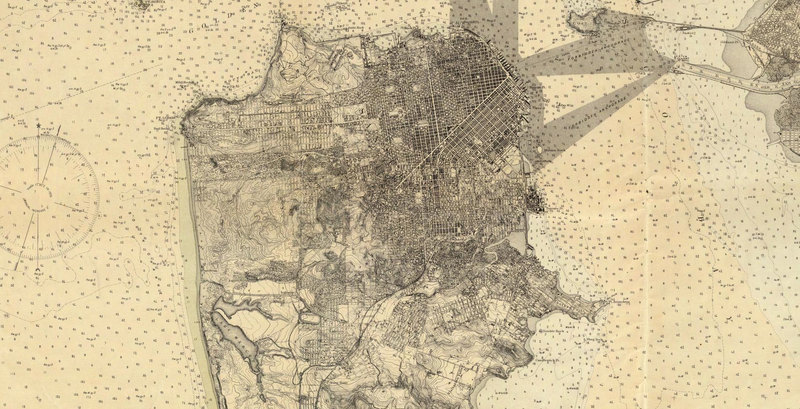 But stippling is used to call attention to the projected landfill that would reduce the size of the San Francisco Bay considerably in the above newsmap. 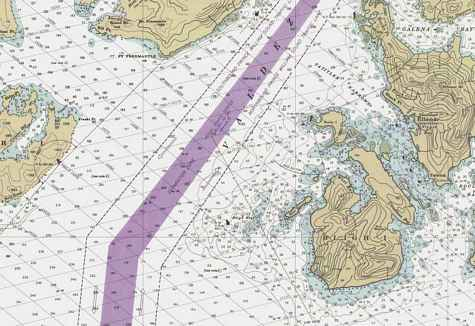 Indeed, the maps so alarmingly suggested the loss of open waters to landfill through the subsequent redefinition of the familiar shorelines into a set of what were clearly artificially narrow estuaries to be a cause for public alarm. The arrival of such an expanse of landfill could be described as achieved according to an artificial delivery of sediment that would be a massive feat of engineering. 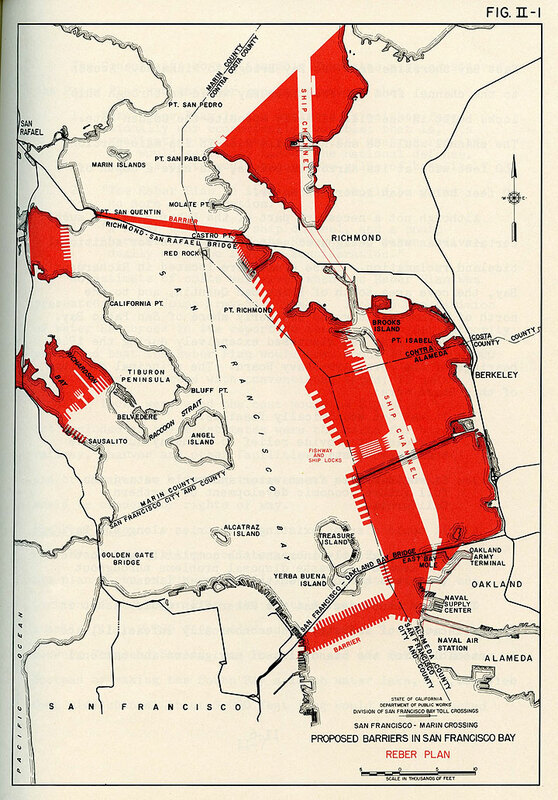 But the map, derived from an engineering proposal that sought to describe the extent of housing lots that might be created by the full expansion of landfill to fill the East Bay, in the model that had already erased Mission Bay and defined the Embarcadero in San Francisco, was less readily interpreted as an advancement of the march of progress as it met readers who were alarmed by the appearance of the reduced Bay’s shoreline. 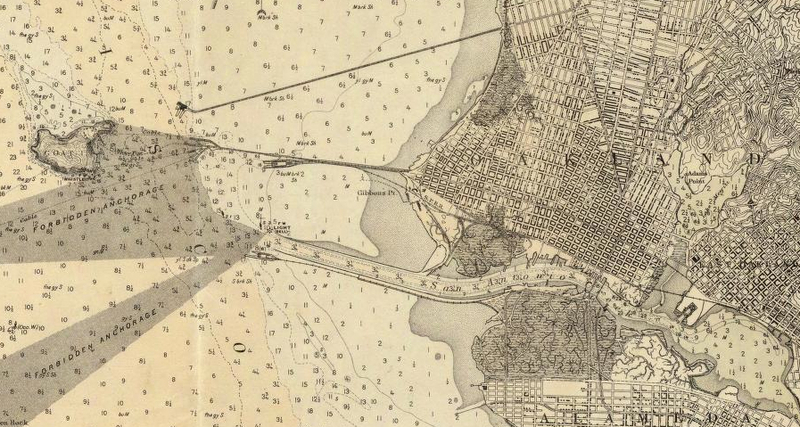 The image of the shoreline that might have been still shocks–though it is easy to be understood also as a continuity with the increased amounts of landfill that defined the city as a peninsula. 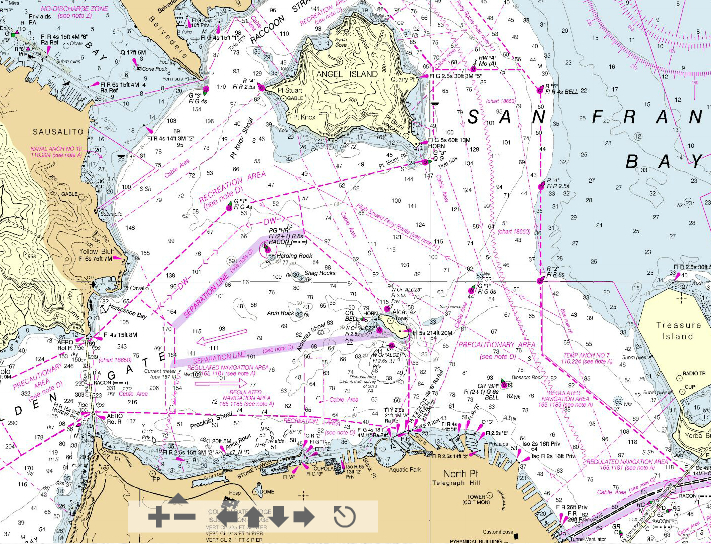 Rather than provide an illustration of triumphalist progress, however, the map became adopted as an icon of local resistance to engineering that redefined the ecological movement around 1962 and gave it a focus on the preservation of open waters that still exist. 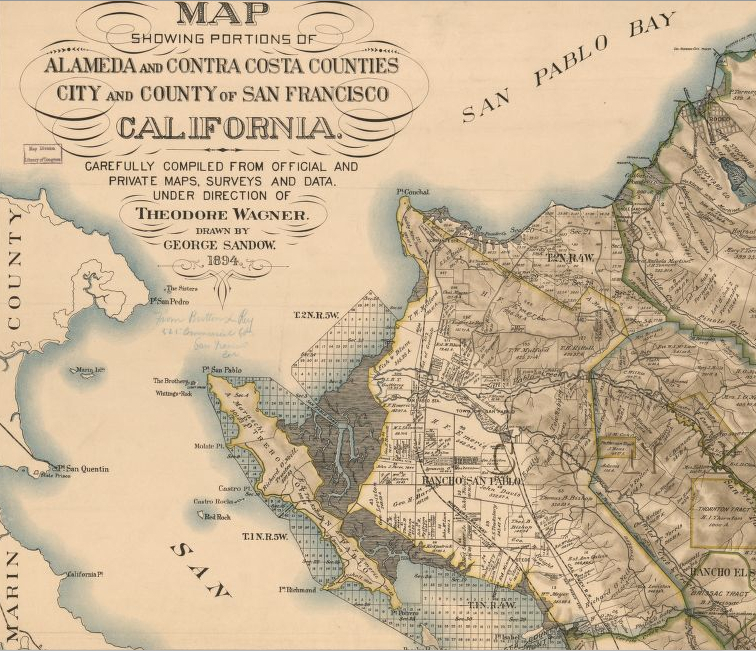 Mapping is deeply tied to cognitive modeling, as much as to precision, and the historical role that was played by the map that projected the expansion of levels of landfill across the East and South Bay were no exception. 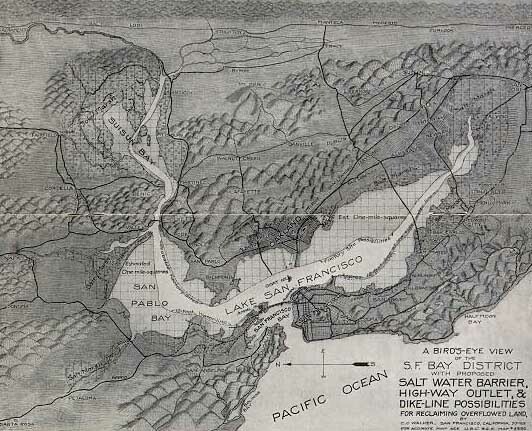 The map first designed for the project of the drastic reduction of San Francisco Bay that was first publicly floated around 1959 in the popular press provided a rallying cry for maintaining the current configuration of wetlands, before the idea of making the San Francisco Bay a habitat for birds and wildlife could have been even foreseen. 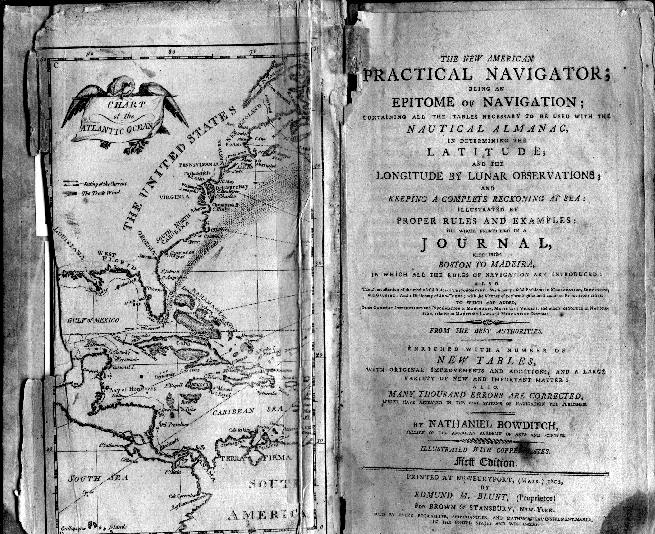 But the map of the potential future that these maps, produced in newspapers, portended helped to energize an unlikely movement, and provided a basis mobilize a rather unlikely coalition in favor of the preservation of the unique ecosystem–and indeed ensure the overlapping of environments of land and sea that are described as “ecotones”–in the Bay Area. 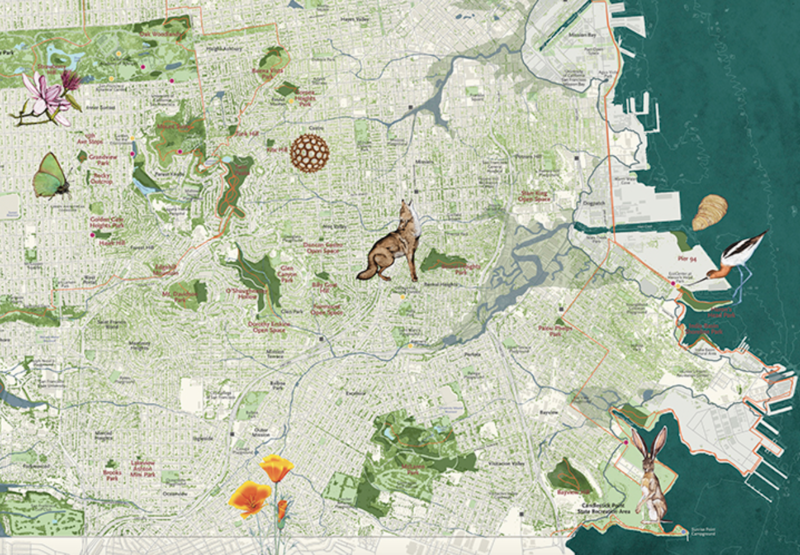 The map, as it was adopted by Sylvia McLaughlin, Kay Kerr, and Esther Gulick of the fledgling “Save the Bay” movement, came to concretize and effectively embody deeply resonant and evocative relation to the liminal areas of its wetlands and its open space, at a time when some 30% of the San Francisco Bay had already been lost to landfill or diking. 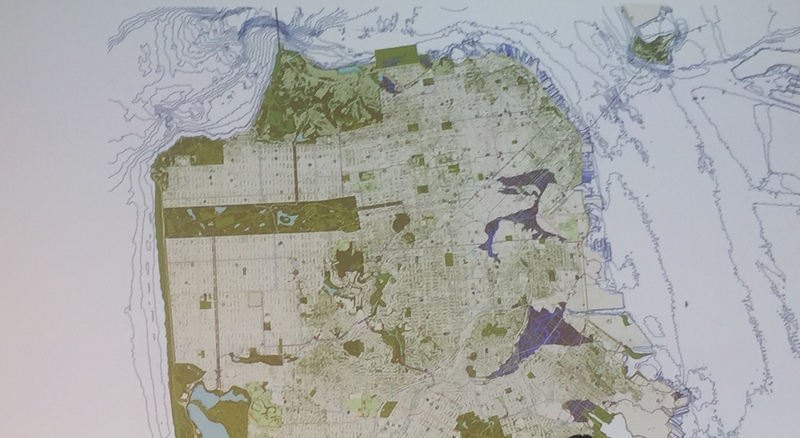 Maps provided a way to visualize the constantly shrinking space of the wetlands, without an eye to either environmental consequences or the potential loss of habitat, as the advance of reclaimed land seemed inevitably associated with the drumbeat of progress, pictured below in three relief maps that foresaw the expansion of landfill expected to steadily reduce the bay’s once watery expanse over the next fifty-five years, which seemed to create new acreage for housing or farming, enclosing once open waters by river banks. 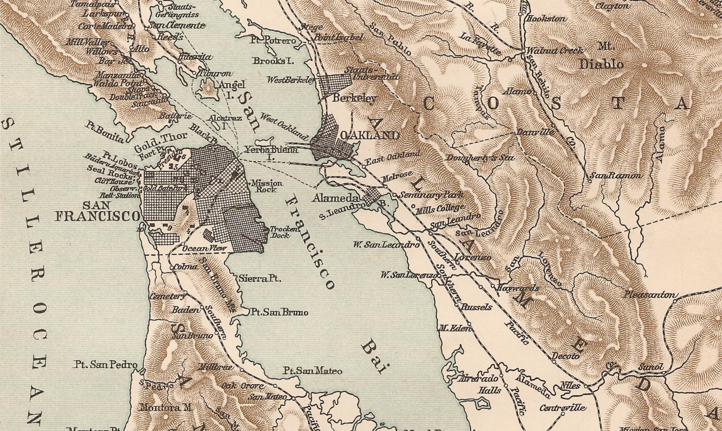 Those reluctant to encounter this almost inevitable expansion of landfill were not only undaunted by the map of the prospective shrinkage of the San Francisco Bay, and progress of the US Army Corps of Civil Engineers, which, according to a map that first appeared in the Oakland Tribune, envisioned a massive reduction by 70% of the Bay’s size by 2020 as part of the region’s modernization. 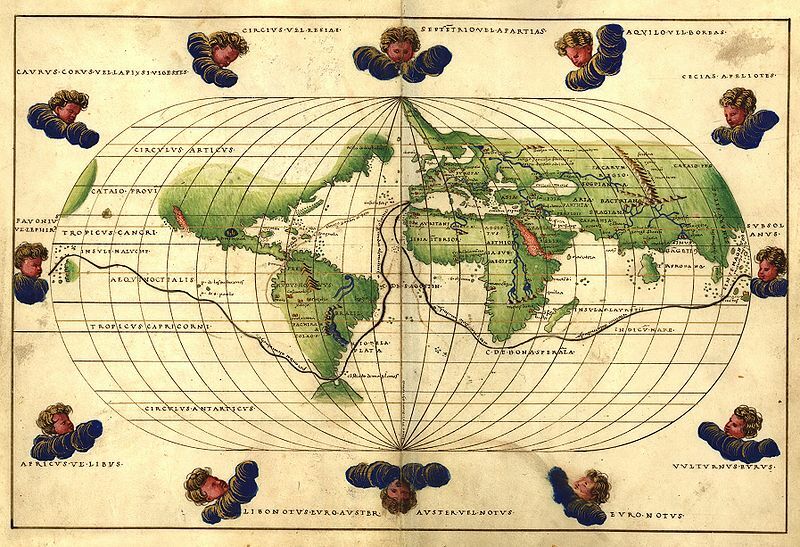 While the future seemed inevitable, somewhat surprisingly, the same map was adopted and reprinted with the new legend “Bay or River?”, inviting readers to reflect on the very inevitability of the shrinkage of open waters with such force that it became a potent symbol and rallying cry. 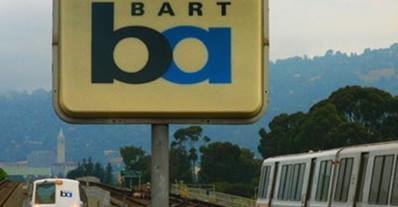 And for the group that approached the Berkeley City Council to turn back the fill project, the iconic emblem became a rallying cry of resistance for the “Save the Bay” movement–then “Save San Francisco Bay”–from 1962. 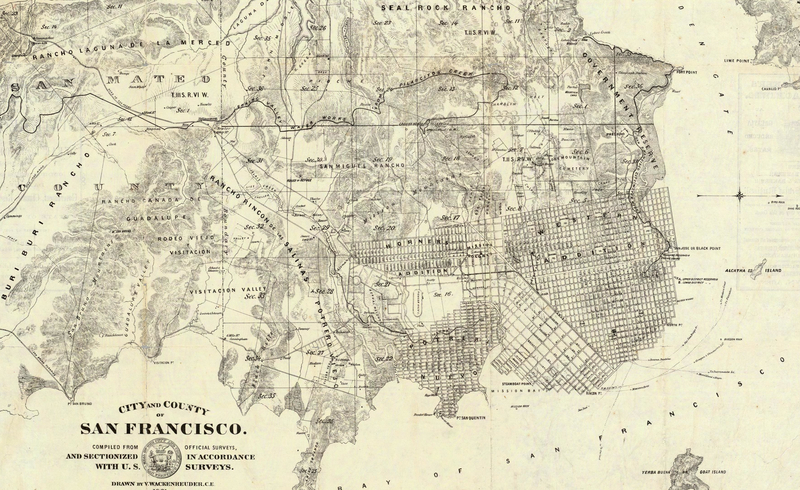 While the expansion of San Francisco was closely tied to landfill, as early maps of the city pointed out to builders when mapping out additions to the city as building lots: the expansion of the short of the city into the Bay of San Francisco was a gradual practice of urban expansion, even if the ghostly outline of the former shore remained encoded in maps as the 1852 Britton and Rey map “compiled from the latest Surveys & containing all late extension” that showed the “lately planket [sic] streets” atop landfill, and the considerable size of what might now be called a liquefaction zone that redefined what had been a harbor and would later become a set of piers, and reconfiguring a once undulating coast as a streamlined shore around a dense downtown. 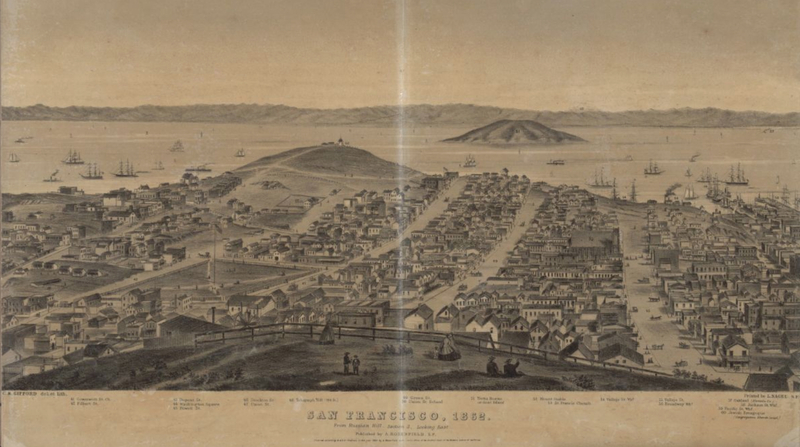 So complicated was the rendering of the proposed expansion of the additions of the mid-nineteenth century that the new additions to San Francisco seem to float above renderings of the current of the Bay, and the original coastline of the peninsula seem more prominent than the ghostly buildings and newly planked streets that lay atop. 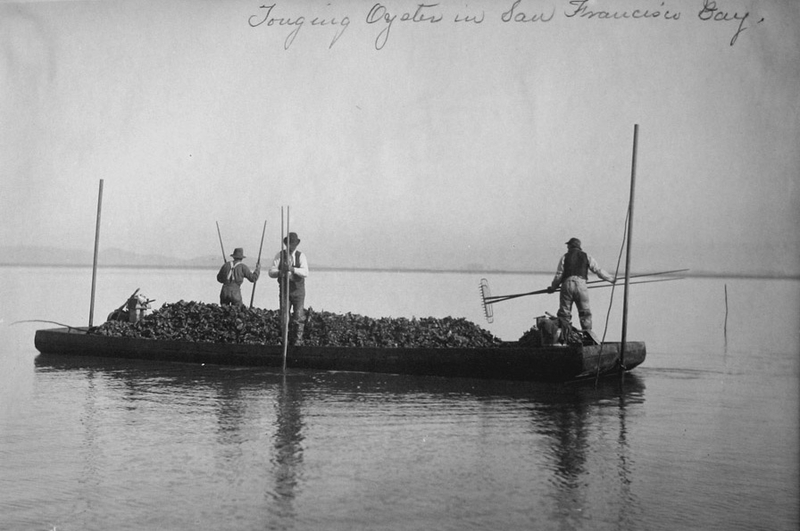 Rather than view the expansion of further landfill as inevitable, the redefinition of the shoreline of the city of San Francisco was more acceptable to prospectors than that of the Bay Area to East Bay residents, who were quick to see the dangers of the dramatic shrinking of the estuary as changing the experience of the Bay, and indeed removing Berkeley from the sea. 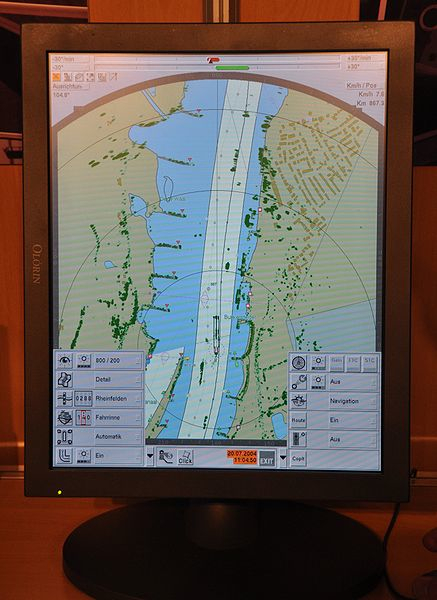 The printing of an effective counter-map countered the project, which would be financially encouraged by David Rockefeller, of filling a full 60% of the shallowest bay waters with housing billed as a “New Manhattan”–and reduce the Bay, already surrounded by some thirty garbage dumps at that time, with a narrow shipping channel to serve Oakland’s port. 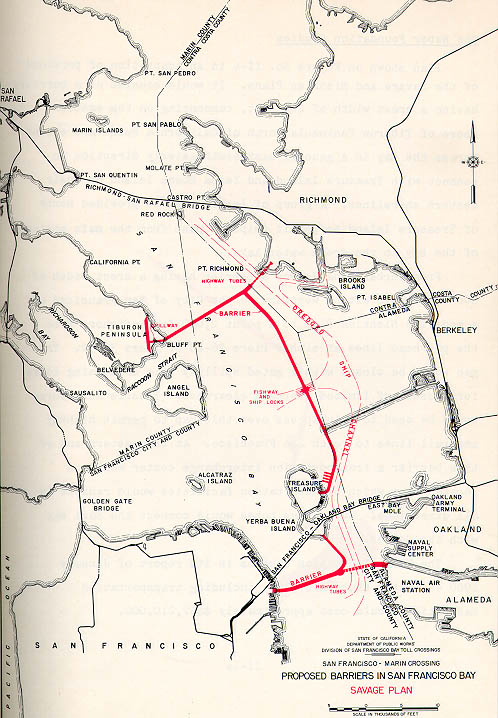 The idea of reducing the waters of the Bay by a full 70%, which were deemed to serve no real “use” or function, aimed to transform it into what was deemed “usable” land, both for the expansion of public housing, and for an expanding of the East Bay some three miles into the ocean–somewhat improbably imagined by plowing the top off the San Bruno mountain and moving the future fill to the West. There was little basis to understand the coherence of the water, or indeed its function, even as it was disappearing before the eyes of local inhabitants. 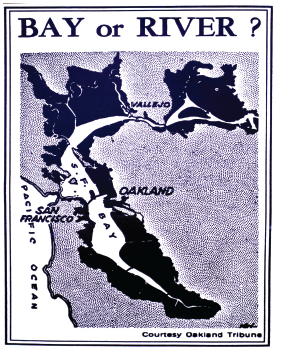 The symbolic success of the map however not only mobilized public opinion behind the rejection of the continued landfill of the bay’s shallower areas, but the rejection of the continued dumping of waste into the Bay Area waters, and according to Richard Walker helped transform the ecology movement into a popular, rather than only an elite, cause. 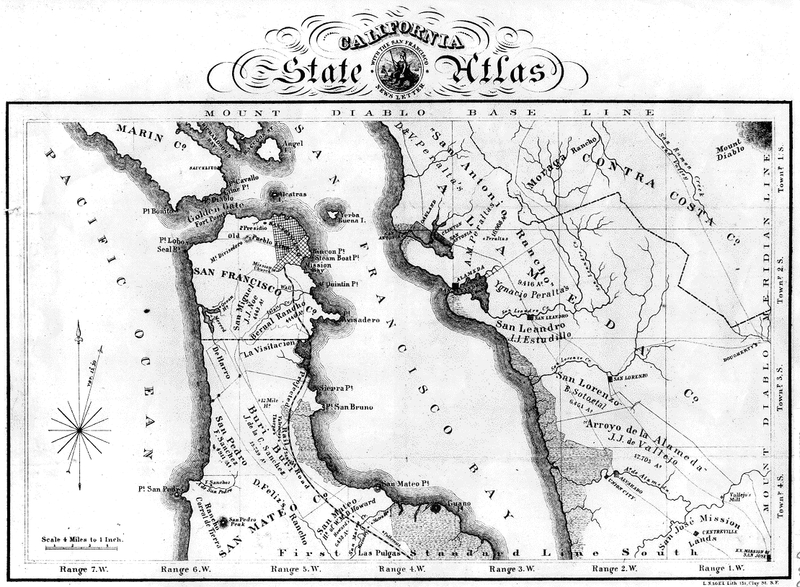 The image of filling some 2200 acres of watery expanse, reduced now to but a slender channel, provoked the project of saving the estuary, although most of the region was at that time closed off to public access, let alone ringed by a Coastal Trail as it is now: of the Bay’s 276-mile shoreline below the entrance of the Sacramento-San Joaquin Delta, less than 5 miles of shore were in fact open to public access. 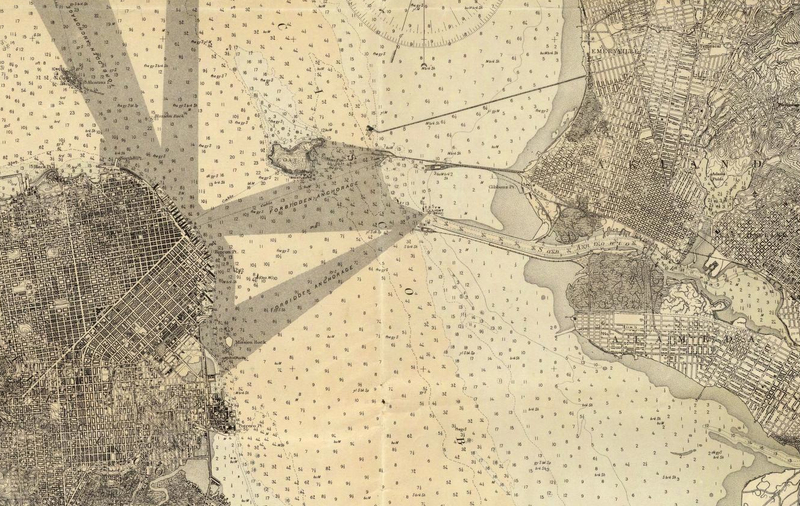 The image of the destruction of the Bay was not focussed on the shoreline, of course, but rather on imagining the consequences of the potential loss of the open waters of the Bay that would change the relation of land to water in an irrevocable fashion.